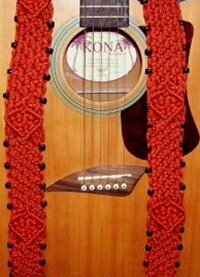 Description: This Guitar Strap is a basic design that is meant for Acoustic Guitars that have screws for attachment. 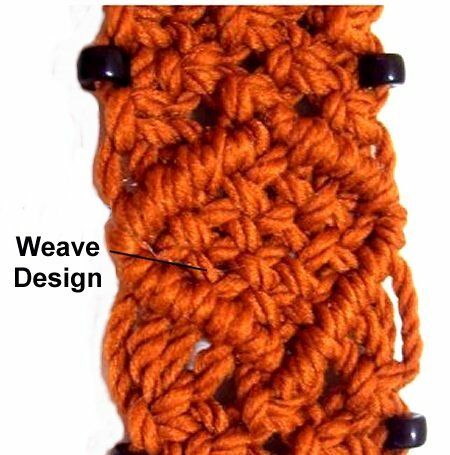 This Macrame pattern features Diamonds made with Double Half Hitches. You can make them all the same, or tie different knots inside each Diamond. This Guitar strap is not adjustable, but can be made any size, by using the tables and formulas below. Use the two tables below to determine the length of each cord, and the number of cords to cut. Length of each cord (in inches) x Total number of cords. Multiply the finished length by 5 (round up to a whole number). Cut each cord to that length. Step 1: Locate the center of the cords and secure them to your project board or work surface, so they rest vertically. Design Tip: Make a bundle with each cord if you find it difficult to work with the long strands. Move down around 8 inches from the center, and wrap the cord around your hand several times. Stop when you have about 12 inches left. Wrap the end around the center several times, to hold the coils together. 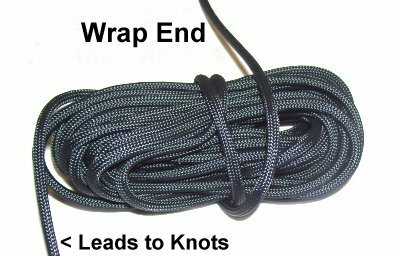 Wrap firmly and pull the end tightly, so you end up with a sturdy bundle. Pass the end under the coil closest to it, to hold it in place. Pull tightly to secure it. As you work on the Guitar Strap, pull to free more material from the bundles. Make sure you tug on the end to tighten the wraps around the center, since the roll gets smaller as you pull from it. There are several sections of Alternating Square Knots (ASK) in each half of the Guitar Strap, which need to be the same size. Take 1/2 the finished length of the strap and subtract 10 inches. Divide that number by 4. This final number is the length you should make each section of ASK. 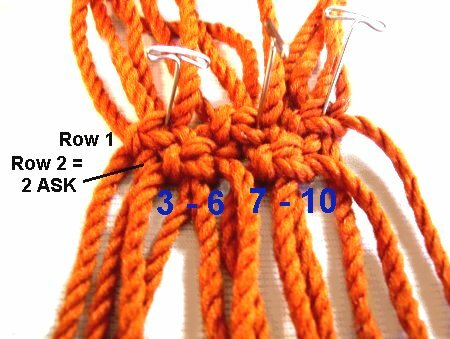 Step 2: Begin the Guitar Strap by tying the number of rows of Alternating Square Knots you have determined in the steps above. Start at the center of the cords and work towards one end. 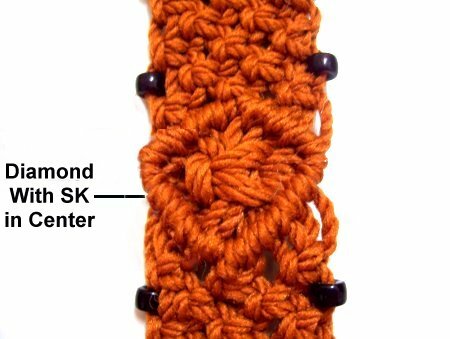 To decorate the strap, you can add small beads to the working cords furthest to the left and right. 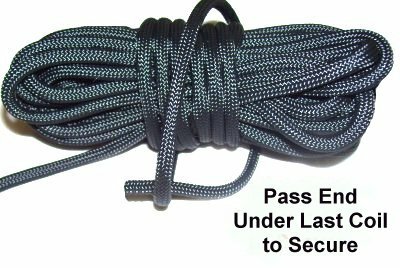 Make sure the last row you tie is one where you use all the cords (odd number -- see below). Tie the ASK with 2 working cords and 2 fillers. Step 3: The chart below shows you the cords you will use for the diamonds in the Guitar Strap. The holding cords are in the center, and are used to hold the Double Half Hitches, which are tied with the remaining cords. Cross the right holding cord over the left holding cord, and secure it diagonally on the left. Attach the left working cords to it with DHH. Start with the cord closest to the center, and work towards cord 1, which will be on the outside left edge. Step 4: Secure the left holding cord on your right, diagonally. Attach the remaining working cords to it with DHH. Progress from the center to the right. Step 5: Do not use the holding cords for this step. Leave them secured to the board. Use the first and last two cords as the working cords (total of 4). They work together to tie the knot. The remaining cords are the fillers. Tie one Square Knot, so it rests in the middle of the diamond shape. It will be large and thick. Step 6: Move the left holding cord towards the center (right). Make sure it’s diagonal and pulled taut. Step 7: Do the same with the right holding cord. Attach the right working cords to it with DHH. Step 8: To complete the diamond, attach one holding cord to the other with a DHH. Step 9: Repeat steps 2 - 8 two more times, so you make a total of three diamonds in the first half of the Guitar Strap. Important: Make sure the rows of ASK are the same size, between each of the diamonds. Finish the first half of the Guitar Strap with another area of ASK. Stop on a row where you use all the cords to make the ASK (odd numbered row). Design Tip: To see what other options you have for the inside of the diamonds, go to Vintage Diamonds. Step 10: Go back to the center of the Guitar strap and remove the pins. Turn the whole thing around, so the other half of the cords are resting vertically in front of you. Repeat steps 2 - 9 to make the second half of the strap. Begin at the center and move towards the opposite ends of the cords. The ASK need to be tied in the opposite direction. So if you tied left SK with the first half, tie right SK in this half. Note that in the center, there are two sections of ASK next to each other. That makes the Guitar strap more comfortable at the shoulder. Step 11: Place one end of the Guitar Strap directly in front of you, so the cords are vertical. Alternate the cords and tie the next row of ASK. There will be two unused cords at each end. For a 12-cord design, you tie one ASK with cords 1 - 4, and another one with cords 9 - 12. By omitting the ASK between them, a space is formed. For a 20-cord design, tie the ASK with cords 1- 4 and 5 - 8. 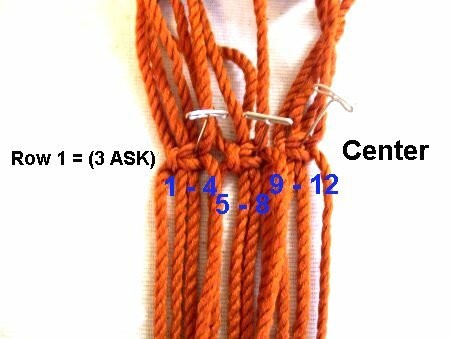 Tie the next two knots with cord 13 - 16 and 17 - 20. Step 13: Alternate the cords and tie the next row of ASK, this time with no gap. Step 14: Tie one ASK with the four cords in the center, which are the cords you did not use in step 12. Step 15: Position the first cord down the left side of the V shape you just made with the SK. Secure it so it's taut, since it's used as as holding cord. Attach the left half of the cords to it with DHH. Locate the last cord and position it down the right side of the V shape. Attach the right half of the working cords to it with DHH. Step 16: To finish outlining the V shape, attach one holding cord to another with a DHH. Step 17: Trim the ends so they are even. 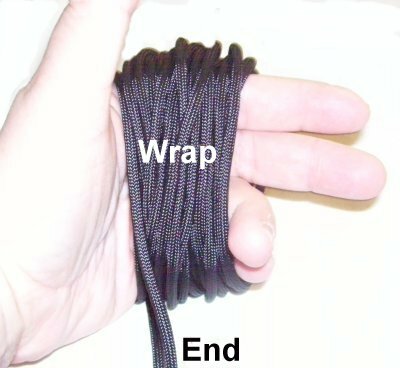 Tie a Barrel Knot at the end of each cord. You can apply small beads to the tips of each cord, if you want to decorate. Tie Barrel Knots to hold them in place. Step 18: Repeat Steps 11 - 17 at the other end of the Guitar Strap. Have any comments about the Guitar Strap? Contact Me.